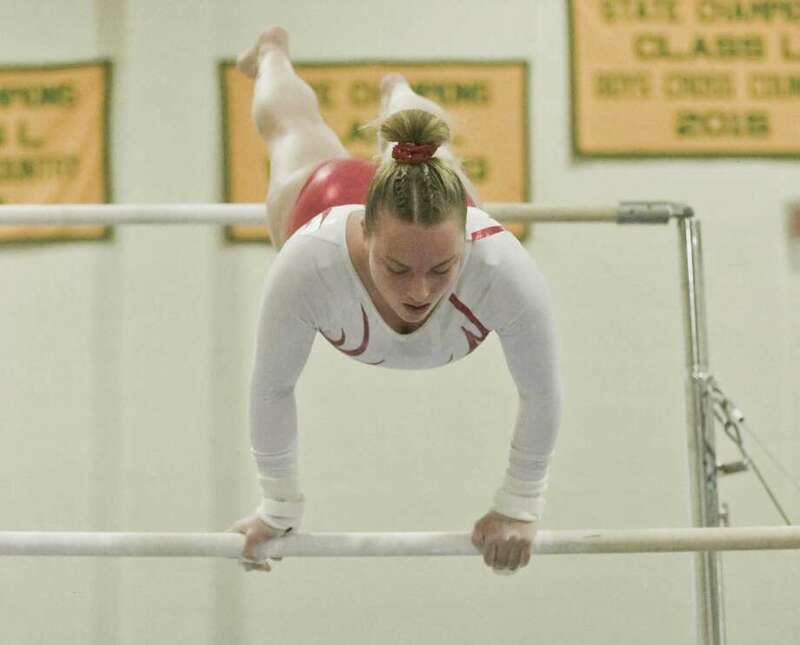 Elizabeth Marino, of Greenwich High School, competes on the bars during the State Open gymnastics championships at New Milford High School. For story and photos visit www.greenwichtime.com/sports. Woodstock Academy owned the State Open team crown from 2012 through 2017 until Greenwich High captured the 2018 Open team title. Well, the Centaurs took the team plaque back in grand style as they amassed a winning score of 142.475 points. Ludlowe High (136.650) was a surprising second just ahead of Greenwich (132.70) and Warde (130.950). Pacing the effort for Woodstock Academy was senior Ali Crescimmano, who was State Open champ on uneven bars at 9.50 points. Jenna Davidson took first place on balance beam at 9.30. Fellow Centaur senior Lydia Taft, who missed all the state meets last year due to injury, was fifth all-around (35.475) to add further support. The FCIAC found itself in the spotlight in the other events. The top 10 finishers in the individual events along with the top three teams qualified to compete in the New England Championships in Massachusetts. Wilton High senior Jessica Olin was crowned State Open champion on vault (9.625) and on floor exercise (9.725). It was a lovely evening as well for Trumbull senior Merritt Stevenson. Her consistency carried her to the State Open all-around title (36.30 points). Stevenson edged out Woodstock Academy’s Crescimmano (36.0) and WA’s Davidson (35.875). Wilton’s Olin (35.50) was fourth. Stevenson took second place on vault at 9.50 thanks to her yurchenko double-flip move in the event. Team scores: 1, Woodstock Academy 142.475 points (7th Open title won in eight years); 2, Ludlowe 136.650; 3, Greenwich 132.70; 4, Warde 130.950. All-around: 1, Merritt Stevenson (Trumbull) 36.30; 2, Ali Crescimmano (Woodstock Academy) 36.0; 3, Jenna Davidson (Woodstock Academy) 35.875; 4, Jessica Olin (Wilton) 35.50; 5, Lydia Taft (Woodstock Academy) 35.475; 6, Kelsey Fedorko (Greenwich) 35.175. Vault: 1, Jessica Olin (Wilton) 9.625; 2, Merritt Stevenson (Trumbull) 9.50; 3, Ali Crescimmano (Woodstock Academy) 9.425; 4, Gianna Cardini (Greenwich) 9.375; 5, (tie) Kelsey Fedorko (Greenwich), Schuyler Tomey (St. Joseph), Hanna Laskey (Stonington) 9.30. Uneven bars: 1, Ali Crescimmano (Woodstock Academy) 9.50; 2, (tie) Merritt Stevenson (Trumbull), Lydia Taft (WA) 9.05; 4, Ava Mancini (Ludlowe) 8.90; 5, Hanna Laskey (Stonington) 8.80; 6 (tie), Jenna Davidson (WA), Tara Chomienne (Ludlowe) 8.75. Beam: 1, Jenna Davidson (Woodstock Academy) 9.30; 2, Maggie McKeon (Killingly) 9.0; 3, Merritt Stevenson (Trumbull) 8.950; 4, Kelsey Fedorko (Greenwich) 8.925; 5, Alaina Karp (Pomperaug) 8.850; 6, Elizabeth Marino (Greenwich) 8.75. Floor exercise: 1, Jessica Olin (Wilton) 9.725; 2, Jenna Davidson (WA) 9.425; 3, Britney Detuzzi (Old Lyme) 9.30; 4, Alaina Karp (Pomperaug) 9.175; 5, Kiera O’Brien (Killingly) 9.150; 6, Schuyler Tomey (St. Joseph) 9.125.